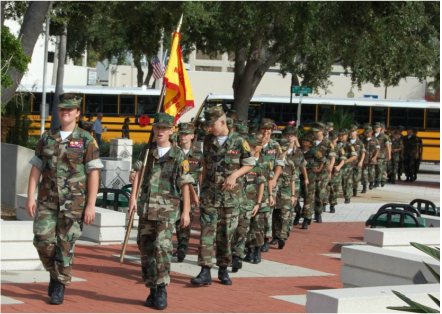 Why is Venice Middle School offering the Young Marines program? Who has expressed support for this new opportunity for Venice students? Parents were the first to inquire about the possibility of an all-day Young Marines program after a strong student interest in the before and after school offerings. There was also a study conducted in south county a few years ago that indicated a desire by families to have a military-based program available to south county students. The School Board of Sarasota County and superintendent, community leaders, the U.S. Marine Corps, Marine Corp League, Venice High administration and JROTC teachers are supporting VMS's vision for the Venice Middle Young Marines program. Venice Middle School is now a designated "magnet" school and can enroll students fromaround the district throughout the summer. What specific classes do VENICE MIDDLE YOUNG MARINES take? The students enroll in their core academic (language arts, mathematics, science and social studies) and citizenship/leadership classes together, and select an elective along with the rest of the VMS student body. The VENICE MIDDLE YOUNG MARINES JROTC instructor also oversees before and after school offerings, weekend events, hiking excursions and summer sessions. Any incoming sixth or seventh grader may apply. Commitment agreements are signed between the student, parent and teachers to help guarantee student success. Students also provide a sports physical to qualify for the fitness portion of the program, which includes weight training. Detailed enrollment packets are available in the VMS admissions office. Are there any additional costs for enrolling in the VENICE MIDDLE YOUNG MARINES? The program is free and open to anyone who meets eligibility. Students are asked to purchase a red polo shirt with the United States Marine Corps logo stitched on it, which is available through the school. On Wednesdays, students wear the shirt along with their own khakis, black belt and black shoes. The rest of the week, they wear VMS dress-code approved clothing. What are some of the components of the leadership training? During the summer months, Young Marines have the opportunity to attend the Young Marines National Summer Programs of: Adventures, Challenges, Encampments, and Schools (SPACES). Schools consist of leadership courses. Adventures, have a historical emphasis and are designed with the younger child in mind. In contrast, older Young Marines can participate in Challenges. Challenges consist of training in areas such as survival skills, wilderness training, and waterbased activities. Young Marine Encampments provide the opportunity for Young Marines of all ages to gather together and train as a large unit of up to 700 youth at a time. Over 3,000 Young Marines participate in the programs each year.